Fleetwood’s new signing Kyle Dempsey says the club shares his ambitions after he helped Town to achieve their highest-ever league finish. The Gazette revealed earlier this month that Town were at the head of the queue to sign the 21-year-old midfielder from Championship Play-off finalists Huddersfield. Town are believed to have paid around £400,000 to turn the former Carlisle player’s season-long loan into a permanent switch. A host of Championship clubs and Town’s League One rivals Charlton and MK Dons were reportedly chasing Dempsey, who had a year left on his Terriers contract. But Dempsey, who was Town’s young player of the year Dempsey and made 46 appearances for Uwe Rosler’s side this season, has signed a three-year deal at Highbury. Dempsey believes the move will be massive for his career as Town bid to build on this season’s historic fourth-placed finish. He said: “I think for me to join this club and see which direction this club is pushing in is massive for my career. Dempsey made 24 appearances for Huddersfield following a £300,000 switch from Carlisle but head coach David Wagner allowed him to join Fleetwood last August and become an influential figure in midfield. Fleetwood chairman Andy Pilley says securing the signature of Town’s top transfer target sends out a loud and clear message. Pilley said: “This is a huge signal of intent for Fleetwood Town to be able to sign a player of Kyle’s calibre on a permanent basis. “His displays for us this season haven’t gone unnoticed and we’ve had to fight off a number of clubs from our division and the Championship to tie him down. 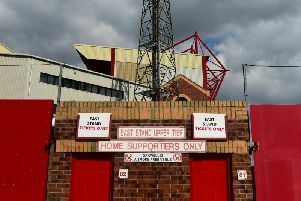 It was a busy day at Highbury as Fleetwood announced they will host Championship club Preston in a pre-season friendly on Friday July 28 (7.30pm) and confirmed that season tickets will go on sale at 9am on Monday.